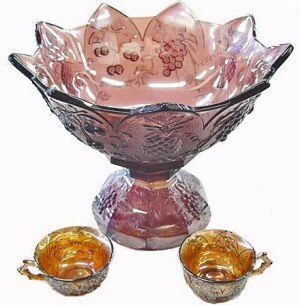 270 COMPOTE - Amethyst: This is another overlooked compote of 6”-7” height. It has a simple design, but nice examples are quite attractive. Scarce in all colors known: Amethyst, Aqua/Teal, Blue Opal, Marigold over Milk/Moonstone and Peach Opal. This amethyst example has a rather nicely turned edge. 270 COMPOTE-Moonstone: Seldom found in the moonstone base. Perhaps the lack of pattern results in overall indifference to these compotes when they surface? 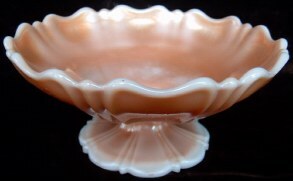 When compared to more plentiful designs, any 270 example, no matter the color, could be considered scarce. SMOOTH RAYS Bowl: The blue opal 9” bowl seen here is an exceptional example for one of these, in that many are not so well endowed with lovely iridescence. The Westmoreland examples in this pattern have rays which extend from the center to the outer edge. 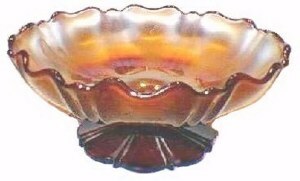 These rays are similar to the Fenton rays, except that the outer edge on the Fenton examples is entirely different. All blue opal bowls are certain to be Westmoreland. There is a rare bowl known in amethyst opal which surfaced in 2002. It brought $85 at auction! 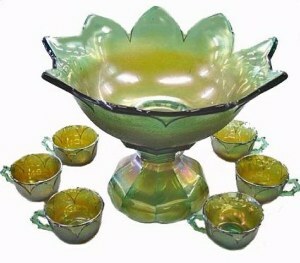 SMOOTH RAYS Bowl: Marigold over Milk Glass base differs from Moonstone in that it cannot be seen through. This color is as desirable as the blue opal, especially when the bright marigold overlay is heavily applied. Teal color 8-9” bowls can be found as well. 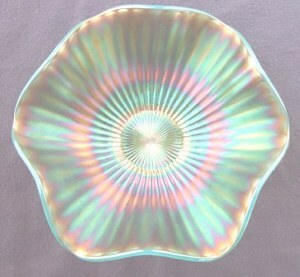 Small compotes in blue opal and purple are also known in this Smooth Rays pattern from Westmoreland. Butler Bros. ad MID-WINTER 1927: Of the original 42 Catalogs we perused, in the creation of the BUTLER BROTHERS REPRINT Catalogs, c.1994, this is the latest date we could locate for advertisement of the ABC CHILD'S PLATE. The last date we worked with was APRIL 1932. 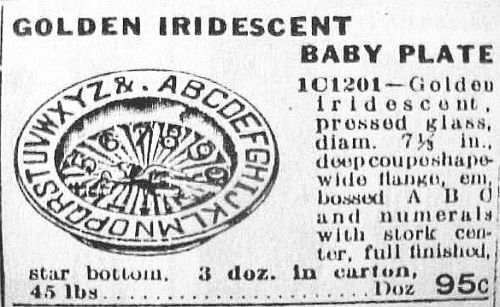 ABC CHILD's PLATE: has been found only in “Golden Iridescent”, as they were billed in sale ads. Apparently, they were treated with care during time of use because a rather steady flow of them appear on Ebay. 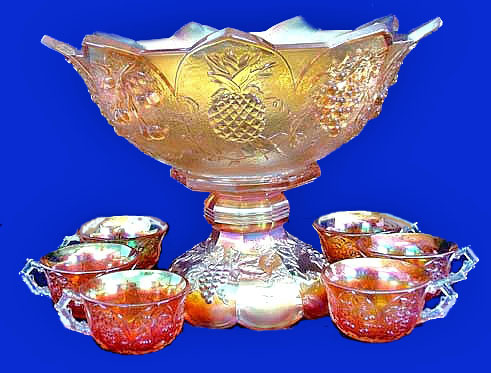 Few auctions of collectors' glass provide access to them, so should you desire one for your collection, you should avail yourself to some of the better examples seen in the vintage carnival glass category over eBay. 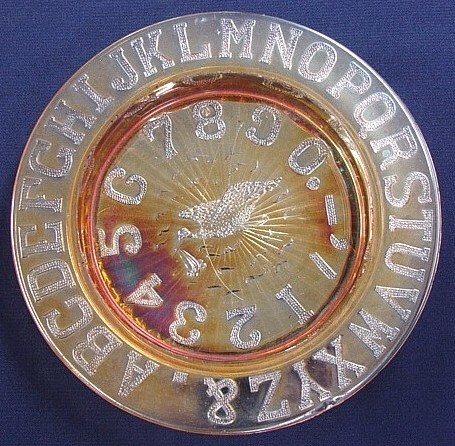 (A very good example of a “straw mark” displays itself on the face of this plate.) Click on Carnival Terms and scroll down to Straw Mark for explanation. FRUIT SALAD in Peach Opal. 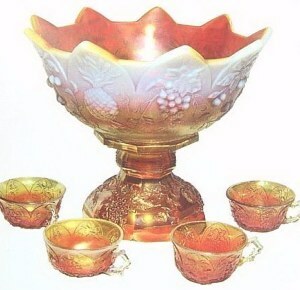 FRUIT SALAD PUNCH SET: The pattern is known only on this set, having eight prominent projections from the upper edge of the bowl. The lovely fruit design is quite different from other punch sets having a fruit motif. The edge used here, is the same as found on the Westmoreland Orange Peel pattern. 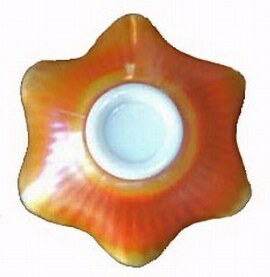 Peach opal, amethyst, and marigold are the known colors. Handles on the cups appear as small twigs. Good iridescence is lacking on most of the sets, which downplays price results, but if you are collecting punch sets, this is certainly one of the rarer patterns to locate! These sets were included in the 30 year+ collection of Alma Ricketts of MO, when Wroda Auctions sold her collection in 2004. Fruit Salad punch sets are quite scarce. Once attained, they usually remain in a collection for many years. Pattern collectors favor those shapes used exclusively on a given shape. ORANGE PEEL from the Oct. 1909 Butler Bros. Catalog. 1909 BUTLER BROS. 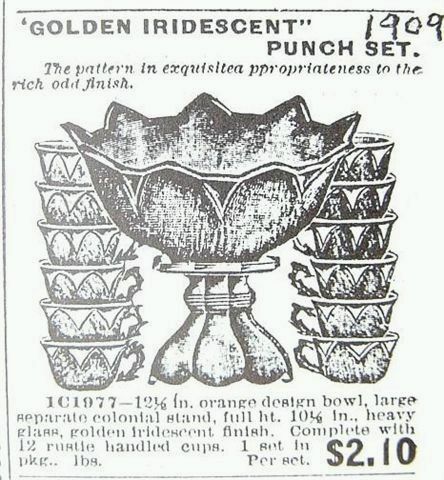 AD: Clearly displays the punch cups having the same “twig-like” handles as those used with the Fruit Salad set. (1909 date written in by the late Frank M. Fenton.) This ad is from one of his original catalogs, loaned to us for use in creating the Butler Bros. Reprints of 1994. ORANGE PEEL in Teal.This pattern dates to 1903. 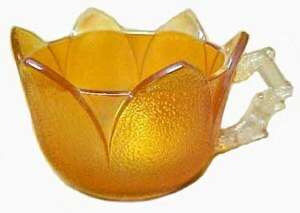 ORANGE PEEL Punch Cup in Marigold--Sherbet tops appear as cups without handles.